Essential oil of Oregano (Origanum vulgare) is believed to be extraordinarily powerful! Taken as part of a programme to maintain a healthy balance of intestinal flora. 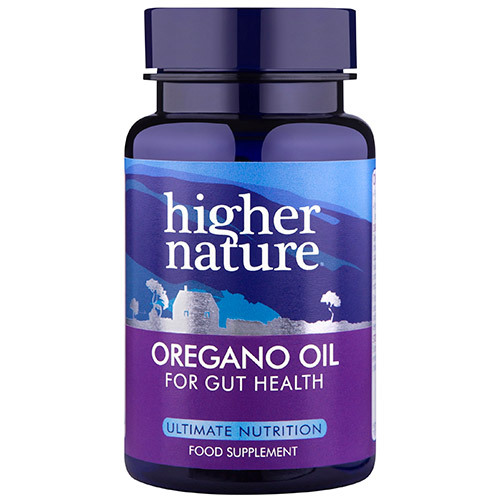 Oil of Oregano also supports immune system health - important for balanced intestinal flora too. It may help the digestion of lipids by assisting bile flow, and support stomach health. Oregano contains strong antioxidant activity, scavenging harmful excess free radicals and protecting the lipids in cell membranes against oxidation. It may be useful for respiratory tract health,a healthy heart, normal blood pressure, and strong, elastic blood vessels. It also helps maintain a healthy urinary tract and menstruation. This potent oil is blended with non GM soya oil, as the pure essential oil is too strong to ingest undiluted. Contained in convenient, easy-to-swallow, vegetable capsules. 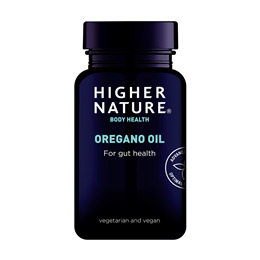 Unlike other Oregano oils, in liquid format, capsules enable delivery of the oil straight to the stomach and intestines. Emulsifier: soya bean leicithin; vegetarian capsule: hydroxypropyl methylcellulose; oregano (Origanium vulgare) flower essential oil (minimum 35% carvacrol, 27.5% thymol). Take 1 capsule 3 times a day (children 12-15 years old take 1-2 capsules a day), with meals, building gradually, or as your health professional advises. Not advisable if pregnant, planning pregnancy, breast-feeding, or in cases of colitis, gastritis or stomach or intestinal ulcers. Below are reviews of Oregano Oil - For Gut Health - 90 x 50mg Capsules by bodykind customers. If you have tried this product we'd love to hear what you think so please leave a review. Very good product! I'm taking it for my candida treatment. You can notice a little bit of oregano after taste which personally I don't really mind.